Whether it's chunky bathroom pipes or messy wires, every home has their fair share of drab fixtures unsightly enough to throw one's interior off kilter. While you can't possibly get rid of all these ugly (but necessary) elements, you can still stop them from cramping your style! As they say, out of sight, out of mind; Here are some tricks for concealing 7 common eyesores at home. Big and cumbersome, exposed bathroom or kitchen pipes can cause your space to look cluttered and disheveled. Good news is, you can use hollow panels finished with tiles or laminates to conceal these pipes. The pipes above the shower head are concealed using stone finished tiles. Have some extra space within your panels? Create a cubbyhole to conveniently store your bath essentials. Otherwise, applying the right coat of paint works just as well! Following the bathroom's monochrome theme, the pipes painted in jet black are the perfect complement to this space's aesthetic. These electrical wire covers snaking about your home can make it difficult to place furniture and are an unsightly distraction to your bare wall. Here are two ways to fix that; One, mask it using a false wall or ceiling. Two, embrace your wires and go for a grungy, industrial look by painting the trunking pipes black and utilising it as a wall feature. Often found by the doorway or living area, this bulky box of switches is no way a glamorous item to greet guests with. If space permits, a common solution to this eyesore is by covering it over with a cabinet that could double as a key or shoe storage area. The electrical box is deftly concealed within this home's extensive carpentry. With a mess of tangled wires that's almost like a tripping hazard, having a desktop computer can really clutter up your study space. How can you keep those unkempt cables in check? Arrange for built-in carpentry, like a customised study table with special holes to organise these computer wires. An ingenious idea - installing sliding power sockets on your walls so that they are a shorter distance from your computer. If you prefer movable furniture, try this quick DIY method instead; Install a peg board, with clips or plastic ties to secure and coil stray cables. Tuck it at the back of your desk, and voila - a tidy-looking study from the front. They may be convenient, but sleek and stylish? Not exactly. Concealing your rubbish chute actually does your home good in more ways than one - first, your kitchen looks cleaner, and second, it keeps nasty smells and germs at bay. The traditional method is by stowing the rubbish chute in the undersink cabinet. But if that is a tad bit outdated, consider creating a separate countertop/cabinet to enclose or shield the chute from sight instead. This hidden rubbish chute cabinet also doubles as a quaint corner for the homeowner's leafy greens. A hollow countertop that protrudes out helps to conceal this rubbish chute from view, and acts as a multipurpose laundry area. Your bathroom sink may look sleek and gorgeous from the top, but its metal/PVC pipes at the bottom leave much to be desired in the style department. There are many ways for hiding this annoying eyesore - one method is by constructing a cabinet or rack below the sink for storing bath items, covering the pipes in the process. Keeping things light and movable, this foldable sink table can be used to hang towels, effectively masking those pesky pipes in the process. Have a bathroom that's too small for a bulky piece of cabinetry to fit in? Alternatively, you can mask those pipes with leafy potted plants to give your space a lush, natural vibe! 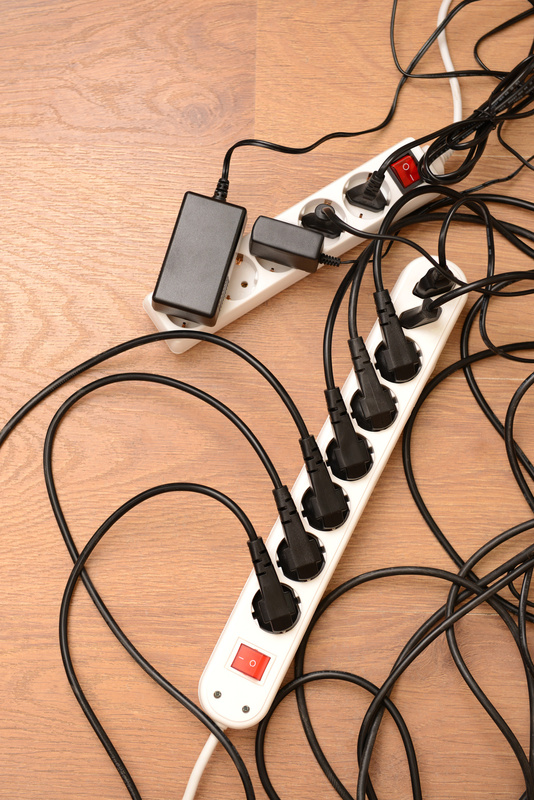 An extension cable is a lifesaver when you need to charge multiple devices in one go, but its chaotic cables are a messy eyesore. Keep them out of sight by converting your end table into a dedicated charging station, built in with power sockets or an extension cord fitted in.